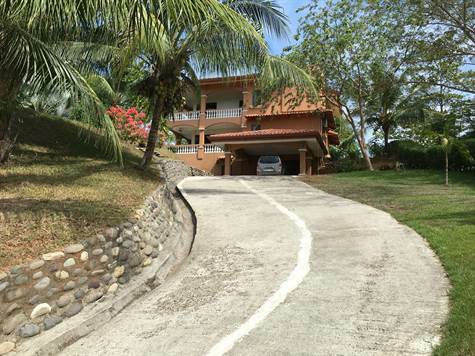 "NATURE- PRIVATE-5 MINUTES TO BEACH"
Bedrooms: 3 "plus 1 in quest house"
This outstanding home is situated on a breezy hilltop with views of the jungle and tropical foliage The property is very private with 2 acres of land. A perfect secluded retreat, yet near to the beach, restaurants, amenities and services . It's the perfect home for the nature enthusiast. Many different species of birds, monkeys and wildlife frequent the jungle and grounds surrounding the home. The main house has a very open floor plan with various balconies, terraces and areas for enjoying the outdoors and nature viewing. The living and dining room have soaring ceilings that are 2 stories in height. Main living area opens to a the covered terrace and pool area. Plenty of room for BBQ's and outdoor entertaining. Stunning in ground ground pool with mosaic tile design on the bottom of pool plus jacuzzi. Property consists of 3 bedrooms, 2 baths plus small 1 bed/ bath guest house. The large large master suite is located upstairs with oversized bath and balcony that overlooks the jungle and pool. Other amenities include an oversized 2 car garage and work shop area. Guest house would be ideal for caretaker / housekeeper as it sits near the entrance to the property.